The population influx associated with the new Standard Oil Company refinery had many impacts on Mandan. The membership of St. Joseph's Church parish reached more than 6,500 members by 1958-59, an unheard-of size for this region and an unworkable number of effective pastoral ministry. 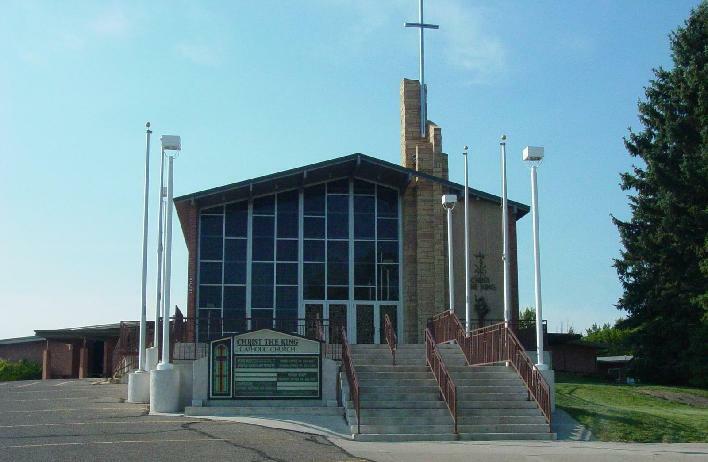 It was time for a second Catholic parish in Mandan. St. Joseph's pastor Aloyius Galowitsch held a kickoff meeting on August 8, 1957. He asked the community for day's wage per month for 30 months. Land was acquired from Dr. William Neff and Clem Albers in northwest Mandan. Bernard Hillyer of Bismarck, a man who designed many of the churches in the Diocese, was selected as project architect. Lund Construction won the bid for the church and school. Even with as much labor from parishioners as possible, the new unit cost $500,000 which was a good deal of money at the time. But Christ the King was a big parish from the start, with about 500 families. Msgr. Galowitsch became its first pastor. Work progressed quickly on the school. Six rooms were ready for classes in the fall of 1958. A multipurpose room was used for parish liturgy until the church was completed. The dedication of Christ the King Church took place on April 28, 1959. Bishop Lambert Hoch of Sioux Falls, formerly of Bismarck, was the celebrant. Bishop Hilary Hacker of Bismarck performed the blessing. Msgr. Galowitsch was pastor for twelve years at Christ the King. In the 1960s, Christ the King School had to be enlarged twice, the 1966 addition including a gymnasium, cafeteria and kitchen. In fact, the school maintained its vigor right through the 1970s, while other Catholic schools were declining. The enrollment in 1984 was still 435, making it by far the largest Catholic grade school in the state. <?xml:namespace prefix = u1 /><?xml:namespace prefix = o ns = "urn:schemas-microsoft-com:office:office" />The Benedictine Sisters of Annunciation Priory taught in Christ the King School from the beginning of its history. They lived at St. Joseph's Convent down the hill, as Christ the King never had its own convent. The Sisters gradually decreased in numbers over the years until they finally withdrew completely in the 1970s. Today Christ the King has an entirely lay faculty. Father John Kuhn became the pastor of Christ the King in 1970. Fr. Kuhn carried forward the reforms mandated by Vatican II. The sanctuary of the church building was renovated in 1980 to better suit the Mass facing the people.